From the cigarette card set “Types of Volunteer and Yeomanry”, issued by W H & J Woods Ltd of Preston in 1902. Having completed the Carolling Hussars recently, I’ve been working on the other regiment for my Christmas decorations; the Christingle Dragoons. 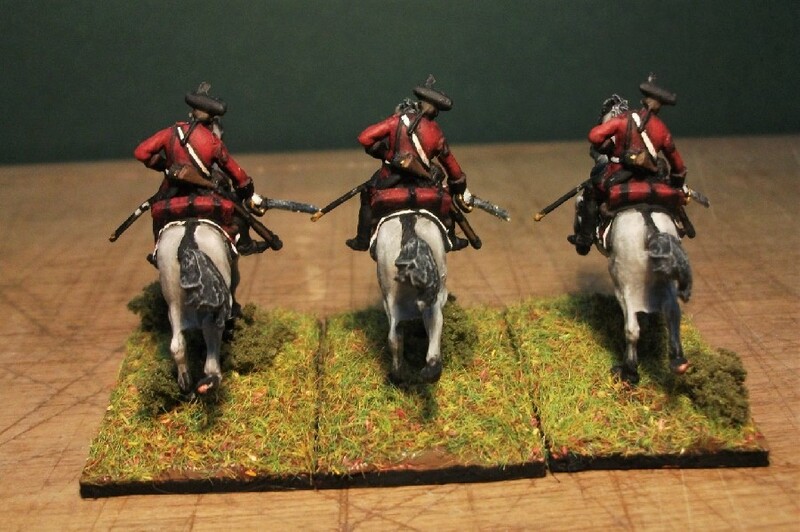 The dragoons are Revell’s Austrian Dragoons of the 7 Years War. 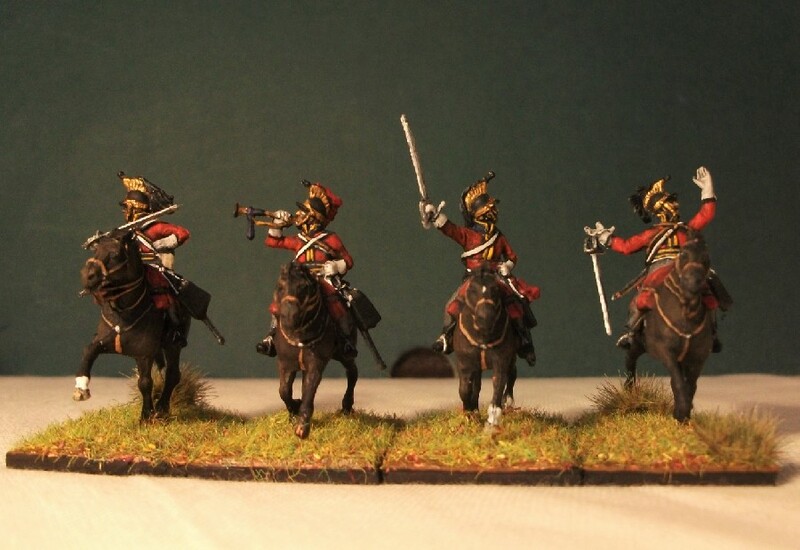 I’ve painted some a few years ago as the Prinz Savoyen Dragoons, so I know they’re an impressive set. 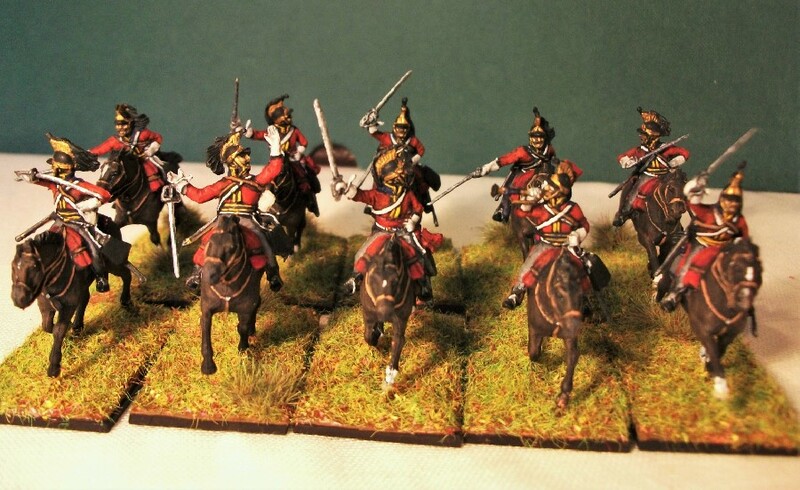 My only quibble is that the beautifully sculpted horses for these dragoons seem to be a significant few ‘hands’ higher than the hussar horses in comparison (see below)! Like Don Quixote and Sancho Panza… OK, so the Christingle dragoon’s horse (right) is rearing up but it appears quite a bit taller than the squat Carolling Hussar’s mount? As with the Carolling Hussars, I’ve based the uniform design on a real 7 Years War regiment; the Prinz Karl Chevaulegers of the Saxon army. This regiment was named after Prince Karl of Saxony (Duke of Courland) and took part in a number of key battles in the war (Breslau, Leuthen, Torgau, etc.). My Christingle Dragoons are named after a curious symbolic object used in Christian Advent services. The Christingle apparently originated with a German Bishop called Johannes de Watteville in 1747, but it took until the 1960s for it to become a British custom which has since grown in popularity. My first encounter with it was a few years ago when daughter first attended a local Christingle service on Christmas Eve. The Christingle is usually constructed with an orange, a candle, a red ribbon, some cocktail sticks and sweets. I suppose, on reflection, an orange uniform with red facings might have been more appropriate!? Never mind, I think green, red and white are good Christmas colours. Just as I did with the Carolling Hussars, I’ve also added a little tinsel to their tricornes; red tinsel for the hussars and gold for the dragoons. Also, you may notice that I’ve painted a small orange and candle Christingle motif. I fancy that some more festive decorations could improve my Christmas cavalry still further. Perhaps some extra tinsel, a mini bauble or some glitter around the base? But my “contribution” to the household Christmas decorations won’t be complete until I finish off the two flag bearers for the two regiments. My girl has designed the flags for my two Christmas infantry regiments in previous years. I’m awaiting her designs for the cavalry flags while I am finishing off the two figures themselves. I asked her to make the designs in the swallow-tailed shape of British light cavalry regiment guidons. I’ll share the finished figures in due course! The Russian Lifeguard Dragoons are now finished and they can join their sister regiment the Lifeguard Cossacks which I completed back in 2015. These Zvezda figures are very elegantly sculpted and beautifully proportioned. The sculpting is so subtle, however, that painting them effectively has been a real challenge. I will admit to liking a little bit more crispness in my sculpting than I’ve found in this set. But with some effort, the end result is satisfying and the Lifeguard Dragoons can proudly take its place as the 23rd regiment in the project. Let me state – I am not a fan of pegs and holes when it comes to assembling plastic 1/72 scale figures. Maybe I’m just ham-fisted when it comes to putting these things together, but I’m not feeling confident that they would survive any careless handling. To get the riders on the horses, I found it far simpler to cut off the pegs and just rely on glue instead. After coping with some traumas, I used glue and a little modelling clay on the base of the horses to better secure them to the stands which comes with the set. Some horses (possibly down to my assembly mistakes) look like they are in the process stumbling head first into the ground! Woah! Do we have a faller, here? Another horse pose I managed to get to stay in place solely thanks to glue alone, the two pegs proving insufficient to keep it upright. Aside from three boxes of standard troopers, I also bought a “Command” set of figures which supplied an officer, a flag bearer and a trumpeter. I foolishly misplaced the sword, sabretache and scabbard for the flag bearer. Instead there’s a hole ready on his thigh to attach the scabbard should I a) locate it, or b) replace it with another substitute. Additionally, I should confess that I wasn’t able to source the correct flag for this regiment and so simply resorted to choosing my own design! Much as I admire this set I’m pleased I’ve finally got this one under my belt. 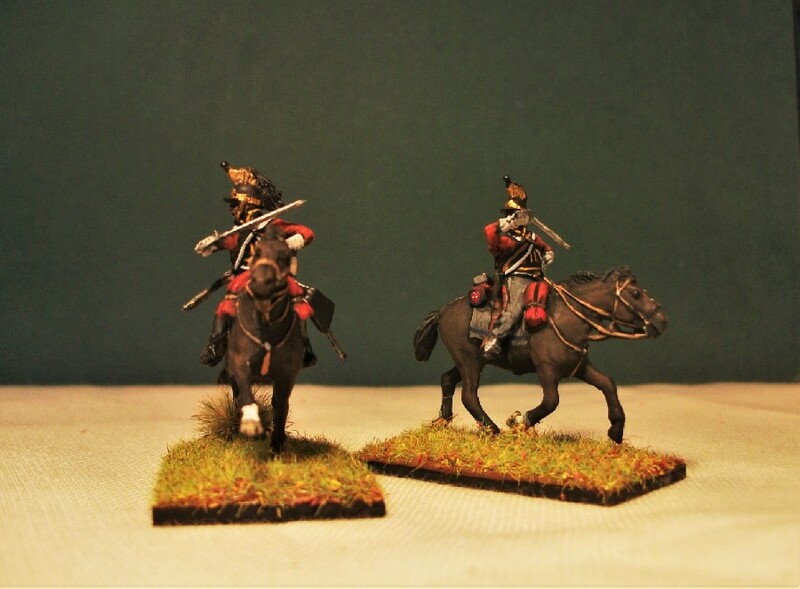 With this set now completed, I’ve painted three Russian regiments in a row; the Astrakhan Cuirassiers, Sumy Hussars and now the Lifeguard Dragoons, all of which were manufactured by Zvezda. As wonderful as Zvezda’s figures are, it is perhaps time for a change of country and manufacturer? The Lifeguard Dragoons were established in 1809 from squadrons previously belonging to the Grand Duke Constantine’s Uhlans. Taking their inspiration from Napoleon’s Dragoons of the Imperial Guard, it took its place in the Tsar’s Lifeguard Cavalry Corps alongside regiments of hussars, cossacks, cuirassiers or ‘Lifeguard Horse’. Whilst they might have lacked some of the prestige or dramatic uniforms of the Hussars or Cuirassiers, they were were undoubtedly well trained, disciplined and considered superior to other Dragoon regiments of the line. After Napoleon’s ejection from Russia, the long campaign began which would ultimately push the Napoleon all the way back to Paris. 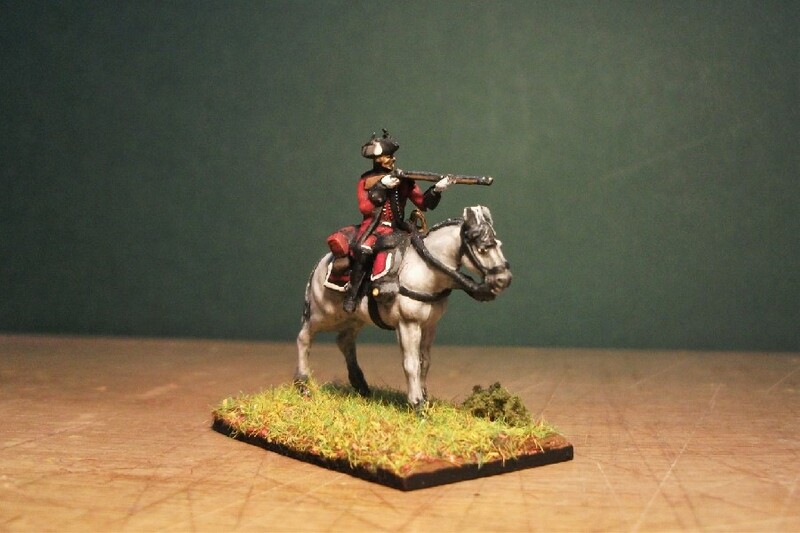 In Kulm in 1813 the Lifeguard Dragoons spearheaded the massive cavalry charge against Vandamne’s infantry. The dragoons attacked the front and ran down one regiment whilst other regiments concentrated on the enemy’s flanks. In April 1813 the dragoons were awarded with St. George standards. In the great battle of Leipzig in 1813, the French cuirassiers routed them in the cavalry battle fought near Gulden-Gossa’s ponds. The following year, the Lifeguard Dragoons fought in the massed cavalry battle of Fère Champenoise for which they achieved the Russian military awards of 22 St. George trumpets. Notable Battles: Borodino, Bezovka, Kulm, Leipzig, Fere Champenoise. Tackling painting Zvezda’s Russian Dragoons has certainly been a challenge. In some ways it’s been a simpler task; the uniforms are far less complex than the Hussars I’ve just finished and there’s less of them to paint too (12 rather than 18). However, painting them has been more difficult in other respects. The figures are beautifully sculpted but the detail is so very subtle (occasionally almost non-existent on the chest) that applying paint effectively to the right places to pick out the features proves tricky. But we like a challenge here at Suburban Militarism, and after some work I think these figures are rather impressive. 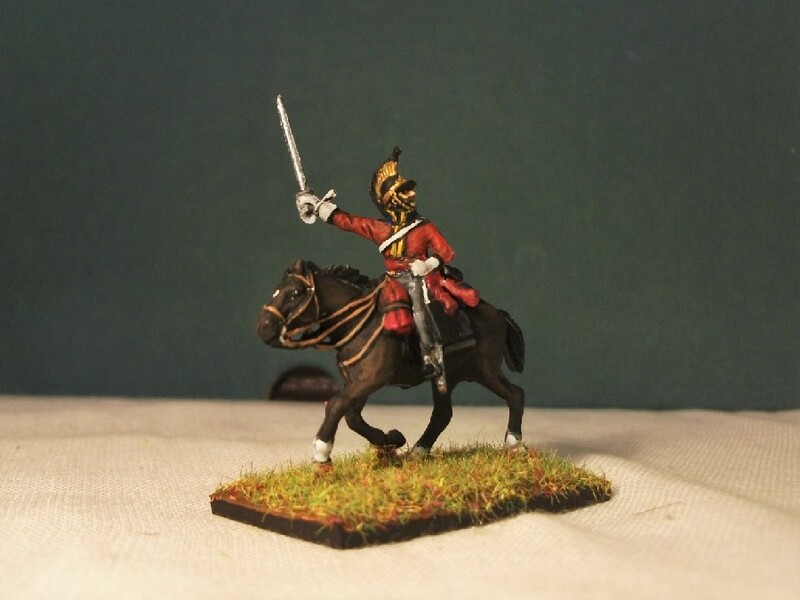 As I mentioned in a previous post, I’ve chosen to paint the prestigious Lifeguard Dragoons, rather than one of the many other regiments of the line. This figure’s guidon and right arm are still to be glued into place. There were as many as 36 different Russian dragoon regiments of the line, some having such exotic (to this Englishman at any rate) names as the Starodub, the Taganrog, the Arzamass, the Kazan and the Zhitomir Dragoons. They looked very similar to each other with their plain dark-green jackets but were distinguished by a wide array of different colour facings. So far as I can tell, the Lifeguard Dragoons, being a part of the Tsar’s elite Guards cavalry, were the only Dragoon regiment to display a red plastron across the front of their jacket. I decided to paint this regiment so that I could make use of this little extra colour. The riders are nearly completed (being a much quicker task than those Soum Hussars!). Now for the horses which I have to report come with their own difficulties unique to this particular set; but more of that in my next update! ‘Star’ Wars: More Zvezda Figures! 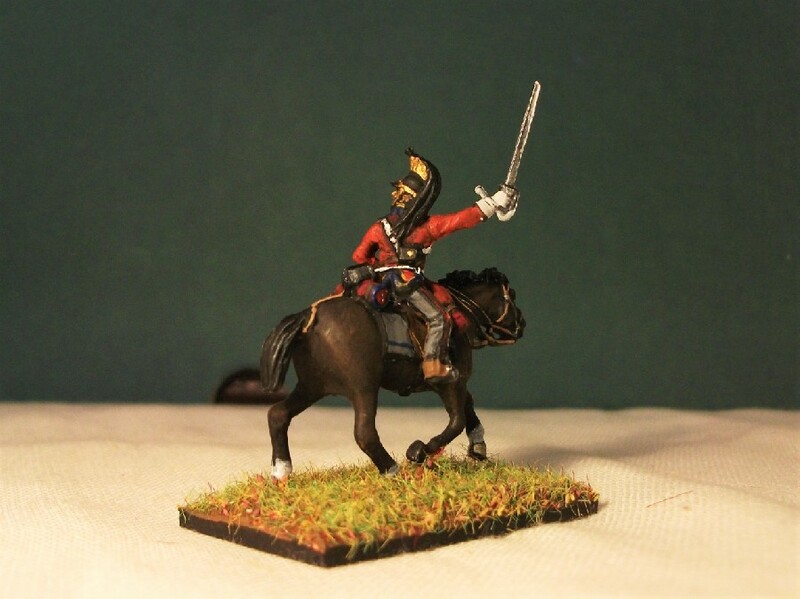 Zvezda is a Russian manufacturer of model kits and figures, their brand name meaning ‘star’ in the Russian language, and it certainly is a star of the Napoleonic cavalry figure world in my opinion. Having already contributed the Lifeguard Cossacks, Red Lancers and French Cuirassiers; and now I’ve just finished their Russian Hussars. All of these have been consistently amongst the very finest of figures in the entire project. I’ve already a couple more kits by Zvezda stored and ready to paint for the project but yesterday I received another one. 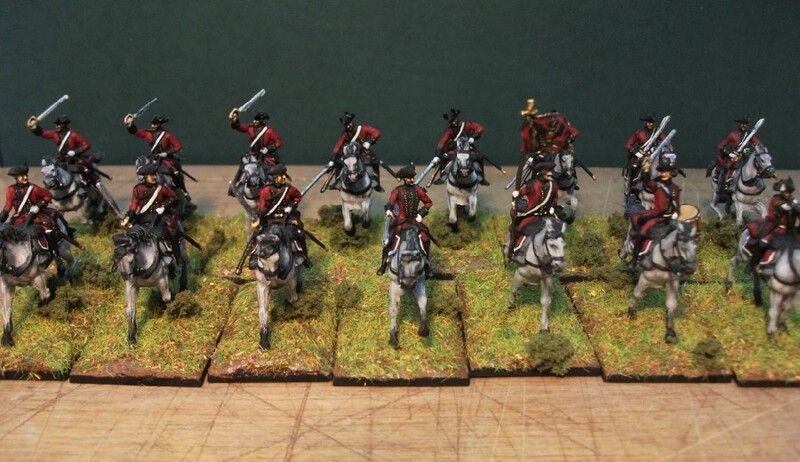 This is a set over which I’d prevaricated somewhat; Zvezda’s Russian Dragoons 1812-1814. My young assistant kindly presents my latest purchases. It seems that Zvezda have in recent years abandoned the traditional 1/72 box of figures and moved into the production of smaller sets of figures for the purpose of their ‘Art of Tactic’ board game rules. 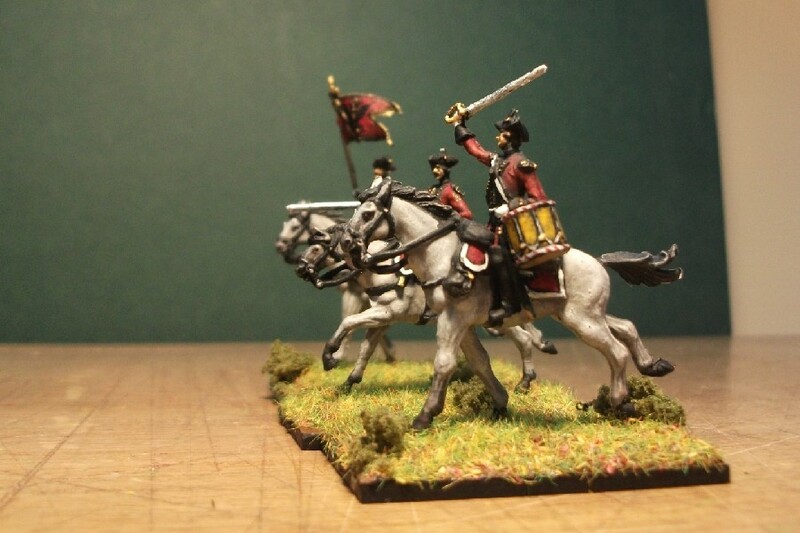 The consequence is that an individual Napoleonic cavalry box now features a mere 3 riders and horses! 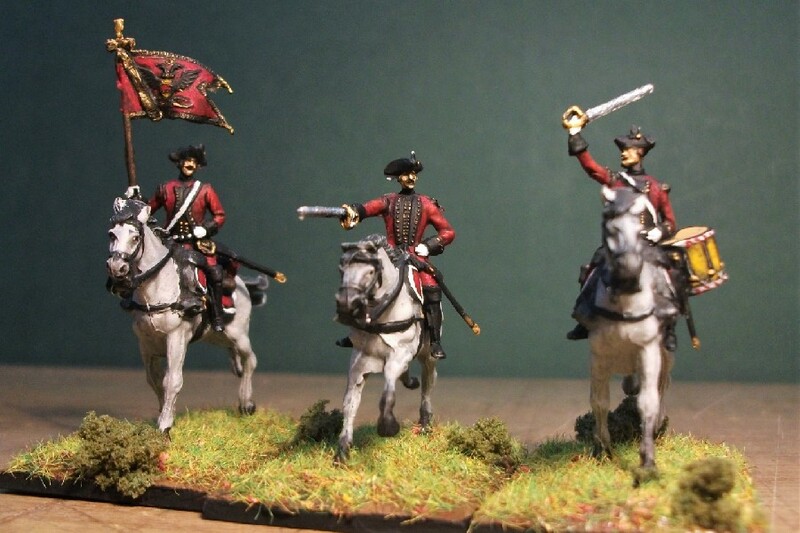 There must be a market for this new approach, I suppose, but I confess to being a little mystified as to why anyone would prefer to buy 3 Russian Dragoon figures for the eBay price of commonly around £6.00 (@ £2.00 per mounted figure) as opposed to spending – let’s say – £8.99 for a whopping 18 Russian Cuirassiers (@ £0.50 per figure)! The overall price is admittedly lower than for the traditional kit (sometimes selling for as little as £4.00) but generally it makes the price-per-figure far more expensive. 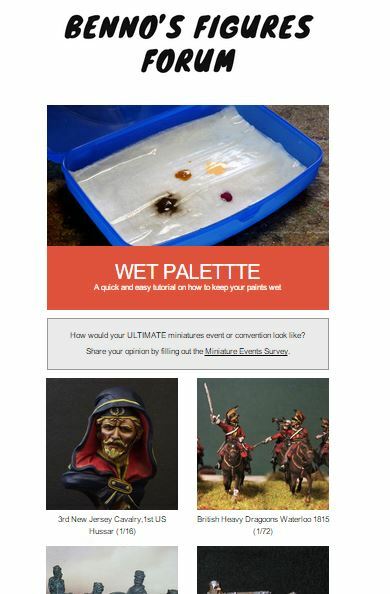 Consequently, building a contingent of a dozen or more figures becomes almost prohibitively costly, that is to say nothing of the cost of painting an entire army. By the way, this is not my attempt at a diorama – the ‘landscape’ is purely coincidental! What’s not in doubt, is that Zvezda make decent figures. If I was to be hyper-critical then I’d say that these dragoons and horses appear a little more stiff and less fluidly animated that in other sets. I’m also a little concerned that they mostly snap together as parts rather than being moulded in one piece, which may cause some issues with painting. Yet they still look good enough to be included in the project. 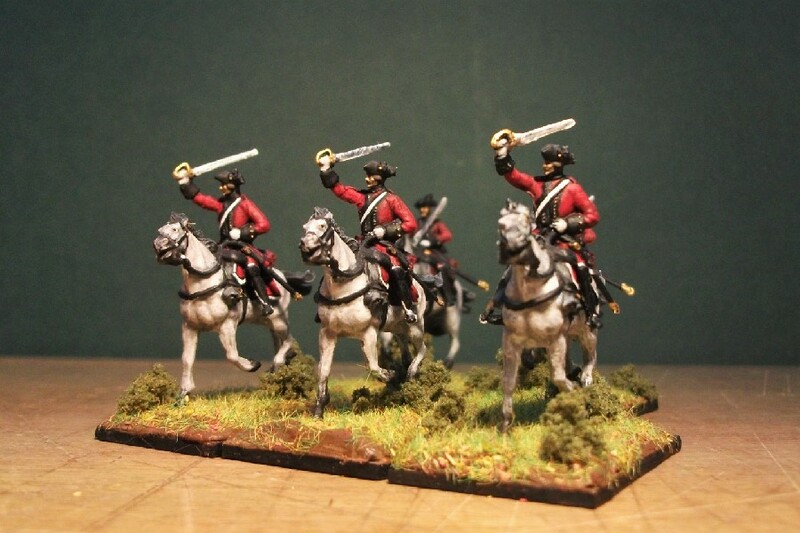 Zvezda’s Napoleonic Russian Dragoons are only available in this new mini-set format and so I’ve purchased four boxes in total (x3 standard Dragoons boxes and x1 Command box) to have enough for one regiment of 12 figures. 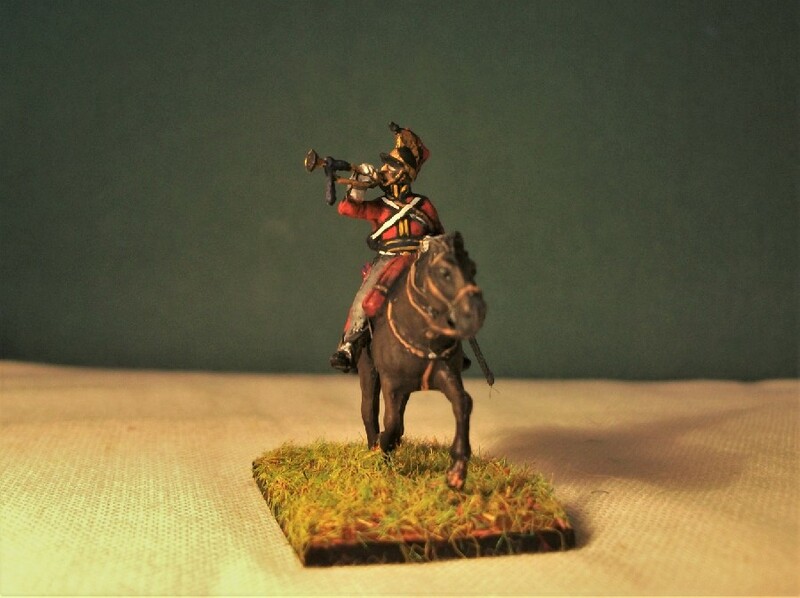 It is no surprise therefore that I announce that the 23rd regiment in the Napoleonic Cavalry Project will be another Russian regiment; the Lifeguard Dragoons (in Russian Leib-gvardii Dragunskii Polk). Following on from the extremely detailed and ornate Hussars, Dragoon regiments are conversely much more simple uniforms. No complex braiding or fur-lined pelisse with these troops, just a plain green jacket with grey overalls. I reflected that perhaps it was a little too plain and so opted for the Lifeguard Dragoon regiment rather than one from the line, as the guards at least had the addition of a red plastron on their chest. Watch this space for developments, until then Suburban Militarism sends best wishes for the Easter break. 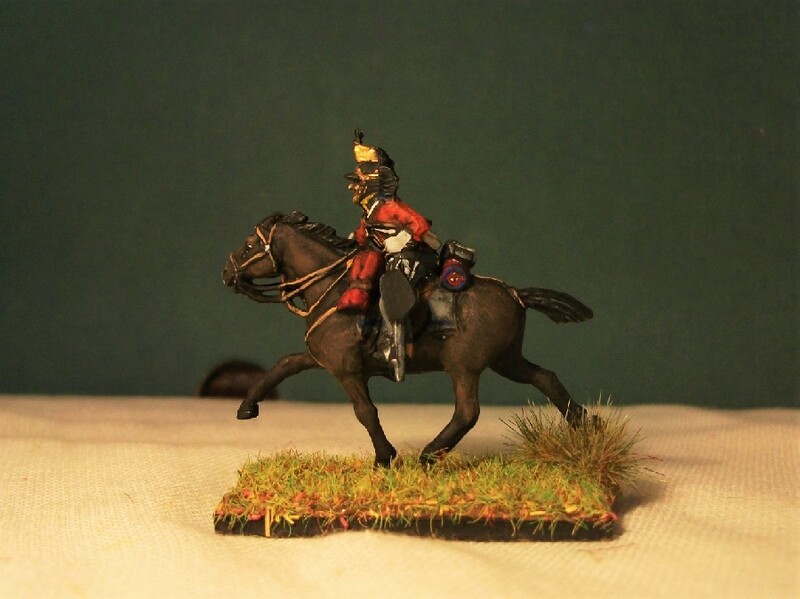 Earlier last year, I painted some Esci Scots Greys for the Bennos Figures Forum Famous Waterloo Project. 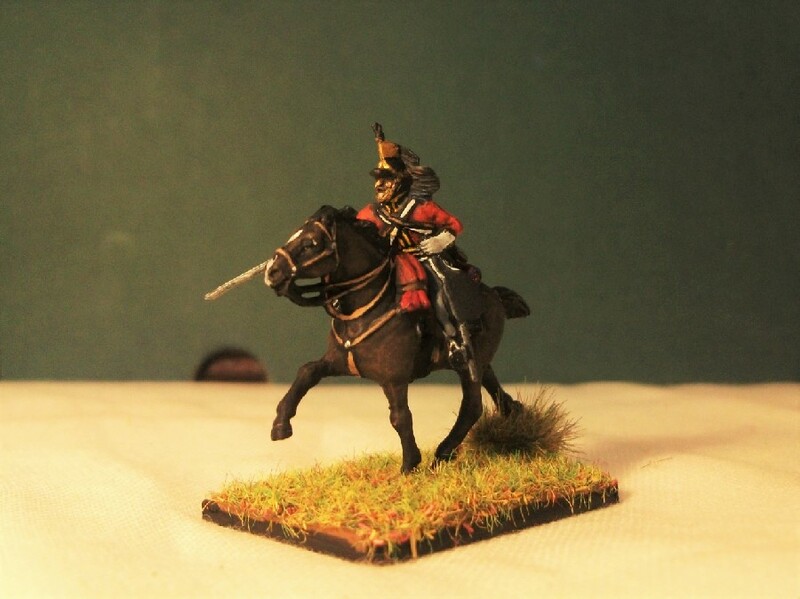 This sparked my enthusiasm for painting Napoleonic cavalry leading ultimately to my Napoleonic Cavalry Project. For some reason, I never showcased the finished regiment but I think they fully deserve a place in the project they inspired, hence this post.I’ve included a section for them on the Nappy project page too. Looking back, with all I’ve learnt in painting horses in the project over the year, I might have painted the greys a little differently. The hooves should not be black on a grey horse. Secondly, I would have painted the grey colour a little differently or perhaps even tried some different types of grey (e.g dapple or steel). Perhaps some of the horse manes would have been grey too. Otherwise, I think they stand up pretty well. I should point out that these are my original Esci Scots Greys figures from my childhood collection! 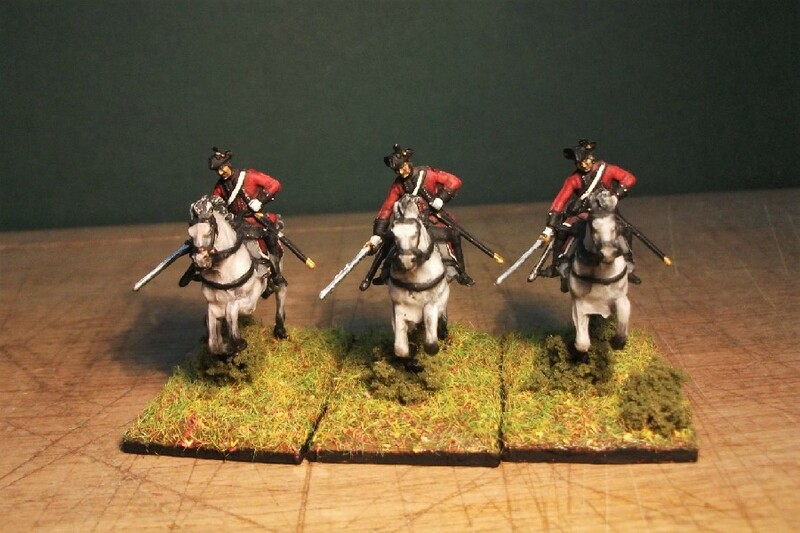 So here they are: regiment #15 in the (ongoing) Nappy Cavalry project! Last year, I dedicated a good portion of my time to tackling four regiments (nearly 200 figures) of Frederick the Great’s Prussian Infantry of the 7 Years War. 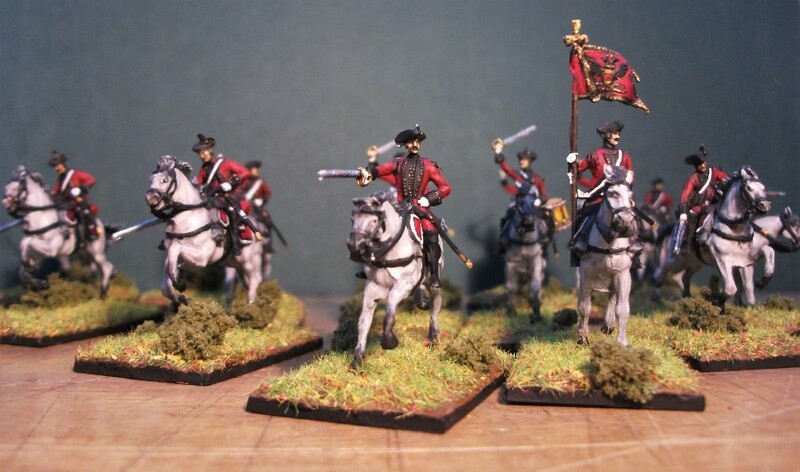 Once I these were complete, I considered that it was maybe time to paint some adversaries too, so I tackled Revell’s Austrian 7 Years War Dragoons set. They are a nice looking set, delicately sculpted in the familiar style of Revell figures. They are perhaps just a little too delicate for my personal taste. I do like a little more distinct detail to hang my paint on, but painted with care there’s no doubt they make a very reasonable cavalry set. Oh dear, it looks like a little paint has flaked off his tricorn…! 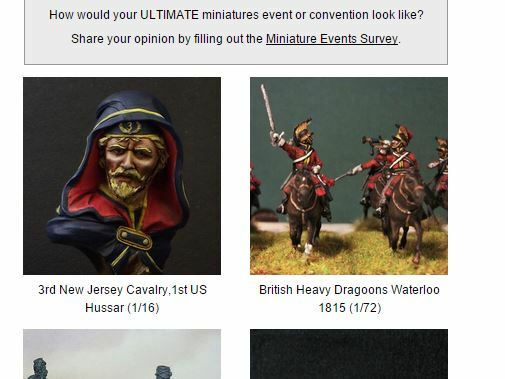 My dragoons have made the news! A closer view. As you can see, my figures were in some very good company! 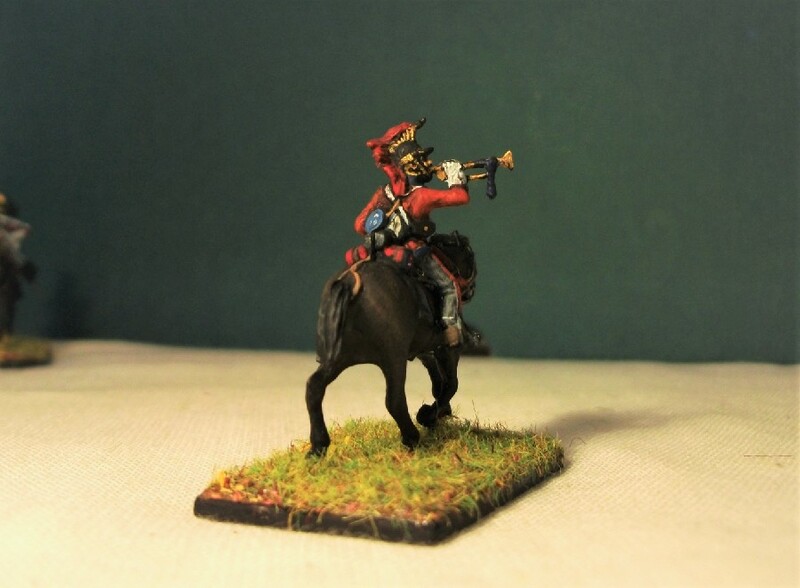 British 1st Royal Dragoons trumpeter, officer and troopers. To finish on a positive though, these figures are undoubtedly a fine looking set so long as the modeller is prepared to spend some extra time and effort preparing and painting them. 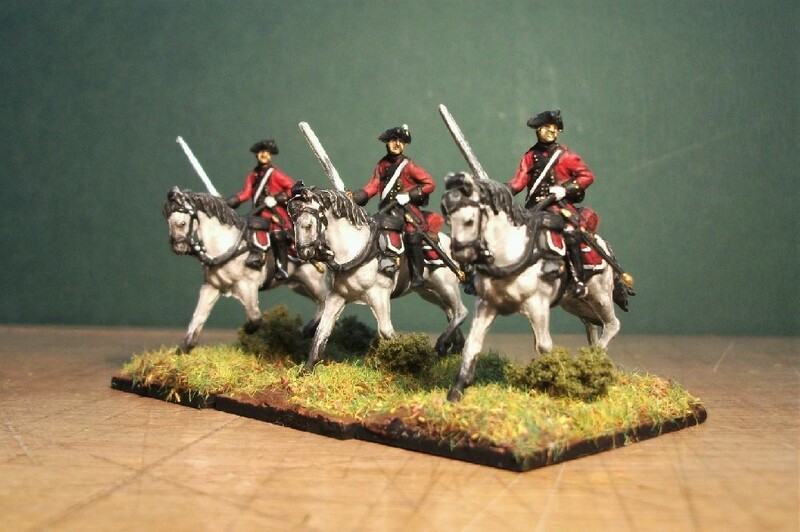 I do think they’re an improvement on the now rare alternative British Heavy Dragoons set produced by HaT, Waterloo 1815’s being more dynamic and offering better sculpting. 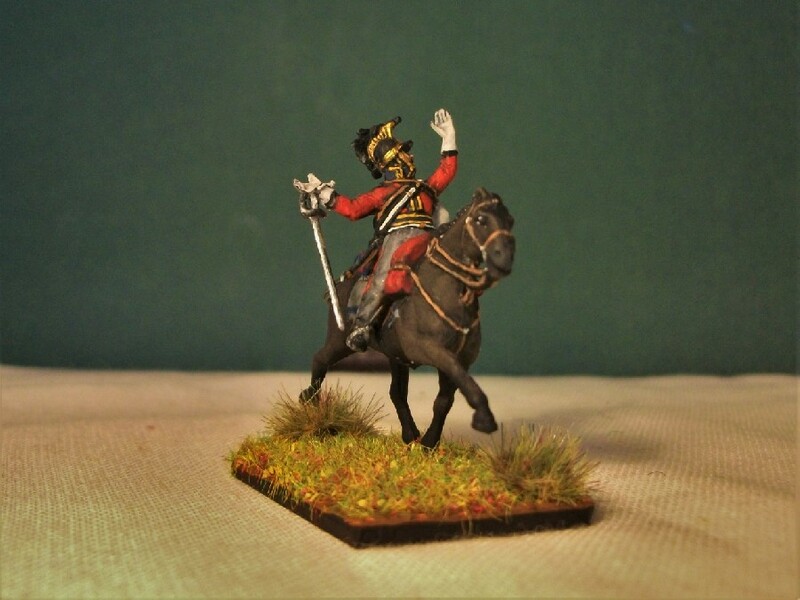 As such, they’re a welcome and essential addition to the Napoleonic cavalry range. You may notice that all the horses I’ve painted are of the same type; dark bays. This is deliberate (not laziness…) as the Royals have been reported as riding on dark bays and so I’ve taken that suggestion literally. These two figures came with separate arms to glue on. It certainly required good glue to keep them in place, but I like the end result and it allowed me to alter the angle of the arms to create slightly different poses. Ouch! A casualty of enemy fire. Trumpeter. 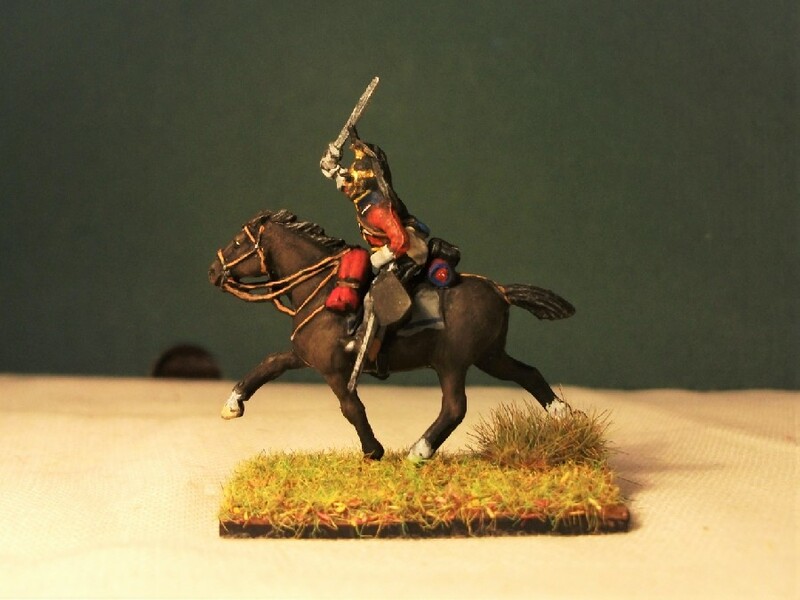 The horse hair is red instead of black, which I believe is correct for British heavy dragoons. Another view of the trumpeter. The 1st Regiment of Dragoons traced its origins back to a troop of Parliamentarian veterans from the English Civil Wars. This troop expanded and became the Tangier Horse (named after where it had first seen service). The regiment was then variously disbanded and reformed until it eventually became a permanent regiment known as the 1st Royal Regiment of Dragoons. Numbered the 1st on account of it being the oldest line cavalry regiment, it was commonly known as simply “The Royals”. It served at the battle of Sedgemoor in the Monmouth Rebellion, at Dettingen in 1743 (where it captured the standard of the Black Musketeers), and later also at Fontenoy. From 1809, the 1st Dragoons served in the Peninsula campaign, most notably in the Battle of Fuentes de Oñoro where it rescued two captured guns. At Waterloo, the regiment was one third of the Union Brigade; a formation made up of the Scots Greys, the Inniskillings (an Irish regiment), and the Royals themselves (representing the English part of the Union). Their initial charge at Waterloo was aimed against D’erlon’s corps as they assaulted Wellington’s centre, but the spectacular charge of the Union Brigade utterly broke and dispersed this corps. In the process, the regiment captured the eagle of the French 105th Line Regiment and helped secure 2,000 prisoners. In continuing on to attack Napoleon’s artillery batteries, they were counter-attacked by French cavalry whilst badly blown and disorganised. The brigade was consequently driven back with heavy losses, and Ponsonby, their brigadier, was killed. They went on to serve in the Crimea, the World Wars and elsewhere. The Royals, as the oldest regiment in the British Army, became a prestigious Guards regiment in 1969 when it amalgamated with the Royal Horse Guards (known as The Blues). The merged regiment formally became known as the Blues and Royals. It now comprises, along with the Life Guards, the prestigious Household Cavalry regiment; the most senior in the British Army. The Blues and Royals today supply a unit based in central London and can be seen on ceremonial occasions, such as Trooping the Colour. They wear dark blue uniforms, dragoon-style helmets with red plumes, and silver cuirasses – a style which is perhaps an echo of the napoleonic era. On their uniform, the charge at Waterloo is still commemorated with an arm badge depicting a French eagle. Battle Honours: Dettingen, Warbung, Beaumont, Fuentes de Oñoro, Waterloo.